Your privacy is important to us. We promise not to use your email address or information for any other purpose than to distribute the newsletters you subscribe to. Have pure vacation inspiration delivered right to your door! 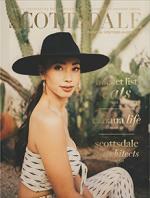 Order your free Scottsdale Visitors Guide, which includes tips from local experts, easy-to-read grids, and a handy fold-out map. Allow 2 weeks for domestic orders and 4 weeks for international orders.